Your child’s dentist can tell a variety of things about your child’s daily life and health simply by examining his or her teeth. Here are four things you may not realize the dentist can deduce! 1. Your child flossed right before the appointment – and that’s the only time. The dentist won’t be fooled into thinking your child flosses regularly just because she does a really good job of it the day of her appointment. When people only floss right before a visit to the dentist, the gums typically bleed and look damaged. Plus, a single flossing session can’t eliminate the plaque buildup that’s occurred due to lack of flossing over a period of months. 2. Your child bites his nails. The dentist may be able to tell that your child bites his nails without ever looking at his hands. Signs that might tell the dentist that your child bites his nails include chips and cracks in the teeth, and other wear and tear, all of which can result from the stress caused by nail biting. The nails themselves don’t actually cause this damage; rather, it’s the friction of the top and bottom teeth against each other. 3. Your child has a sinus infection. If your child seems to be suffering from a toothache, it may in fact be a sinus infection. The reason the discomfort of these two different problems can be confused by patients is that the roots of the top teeth are positioned in the same area as the floor of the sinuses. And both sinus infections and toothaches can show symptoms of pressure. If you child complains of a toothache, have her bend down to touch her toes. If the pressure or discomfort increases when she does this, the pain is likely not related to a tooth, but is rather a symptom of a sinus infection. 4. Your child has an iron deficiency. There are several oral conditions you may have that can tell your dentist that your child has an iron deficiency. These can include oral tissue sloughing off, bleeding gums, increased instances of infection, burning tongue syndrome, sores in the corners of the mouth, and delayed healing of oral injuries. 5. Your child frequently drinks pop and energy drinks. This one may be a little less surprising, but the reason the dentist can tell your child drinks these beverages on a regular basis won’t necessarily be because your child has cavities due to sugar. The fact is, the acidic nature of pop and energy drinks can cause the enamel of teeth to soften, and this can lead to cavities and decay, of course, but it also makes teeth more susceptible to chipping. If your child has a chipped tooth, it may be that regular pop or energy drink consumption is the culprit! 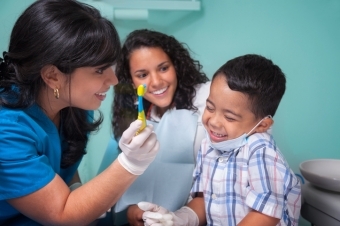 We can help your child break bad oral health habits. Get in touch with SmileTown North Delta today for a consultation!